Brand new casual game fully featured and free from the makers of popular SWIPED game series. 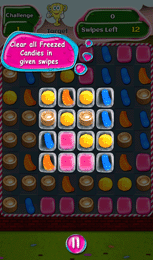 Very simple to learn swipe action game but yet challenging to master and interesting to play.Swipe longest chain of candies in this addictive sweet puzzle game with hundreds of levels in 6 game modes. 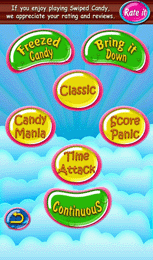 Swiped Candy Support : Runs in over 4000 android mobile devices. 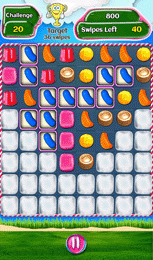 Freezed Candy : clear frozen candies in given moves. Bring it Down : get the food items down and feed the monkeys. Classic : Achieve the target score in 2 minutes. 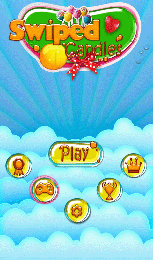 Candy Mania : Collect required candies in 2 minutes. Score Panic : Avoid the score getting below zero. Time Attack : Get high scores in 1,2, 5 & 10 minute time limits. 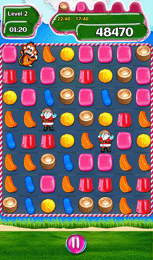 100+ Individual challenges in Freezed candy and Bring it down. 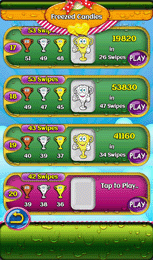 Google play leaderboards and achivements for all game modes. Extra continuous mode with unlimited levels. Fluid animations and eye catching graphics.